View more information about this image. You may order a high quality photographic copy. The Mortlock Wing was designed by Colonial Architect E.J. Woods, amending R.G Thomas' original design, and built by Brown and Thompson at a cost of 36,395 pounds. The background to the building of the Mortlock Wing was long and complex, and a summary is given in the drop down menu on the construction of the building and its uses over the years. The building is French Renaissance in style with a mansard roof. The walls are constructed of brick with Sydney freestone facings with decorations in the darker shade of Manoora stone. There is a chimney on each of the side towers of the Mortlock Wing but not the corresponding Museum wing. The original entrance was on the south-east corner facing North Terrace. 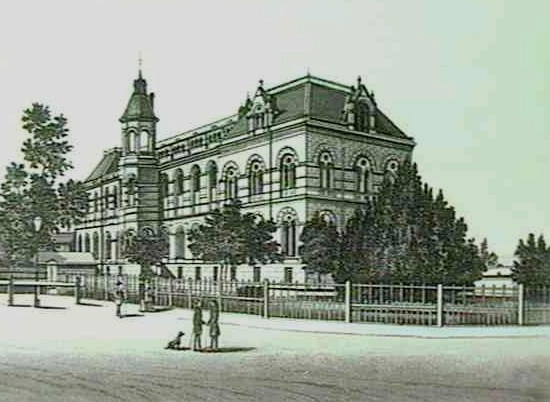 The new building was intended to be part of the South Australian Institute, and but by the time it was completed, the South Australian Institute was a separate organisation, and the new building was known as the Public Library. 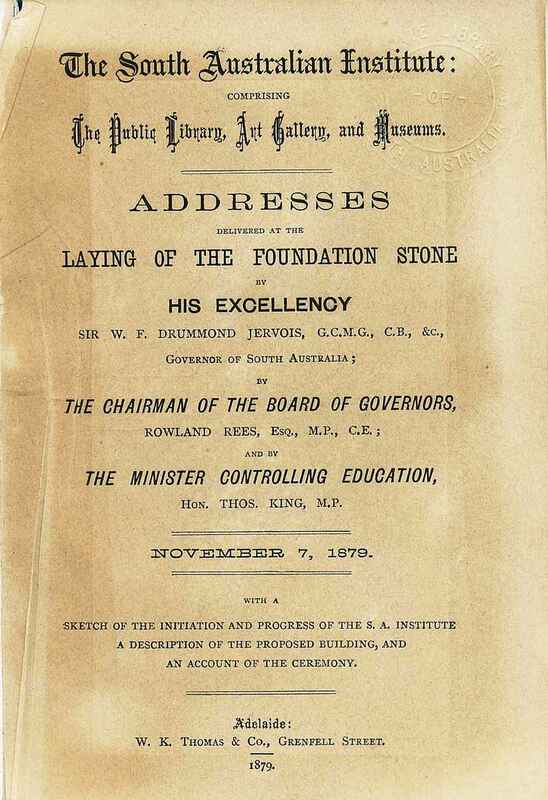 It was opened on 18 December 1884 by His Excellency the Governor Sir William Robinson GCMG. In 1965 the building became known as the Jervois Wing when the foundation stone of the Bastyan Wing was laid, and the Public Library's name changed to the State Library when the Bastyan Wing opened in 1967. In 1984 a heritage study resulted in the refurbishment of the building by Danvers Architects, and in honour of a substantial bequest from John Andrew Tennant Mortlock in the state's Jubilee 150 year 1986 the Mortlock Library of South Australiana opened. In the major building redevelopment in 2003 the Libraries Board named the building the Mortlock Wing to acknowledge his gift to the people of the state. In an interesting connection, the architect of the Mortlock Wing, E.J. Woods, also designed the Mortlock family home Martindale Hall at Mintaro. The Mortlock Wing now accommodates a range of public functions and services, including exhibitions, conservation and reformatting services, study spaces on the first gallery with wireless internet access, the Crawford Room and the Sir Josiah Symon Library - a fine example of a 19th Century gentleman’s library. 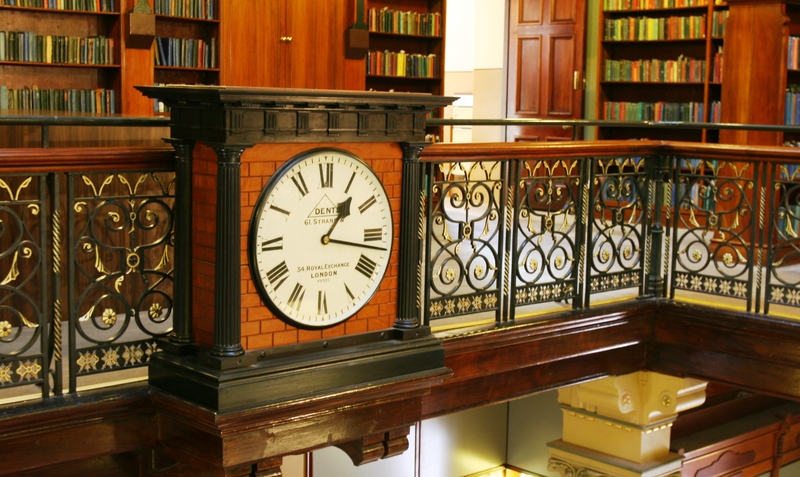 The Mortlock Wing also provides a home for several tenants: the Royal Geographical Society of South Australia and the National Archives of Australia. 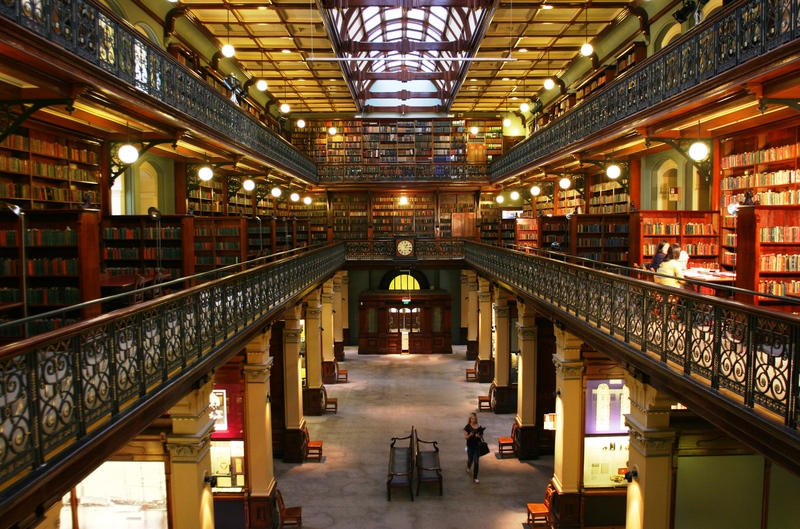 The interior of the Mortlock Wing is unique in South Australia, according to the Heritage of the City of Adelaide (Adelaide: Corporation of the City of Adelaide, 1990) and considered without equal as a mid Victorian public library interior in Australia. There are two galleries, the first supported by masonry columns, and the second by cast iron brackets. The balconies feature wrought iron balustrading ornamented with gold while the glass-domed lantern roof or clerestory allows the chamber to be lit with natural light. Two of the original gas 'sunburner' lamps survive in the office space located on the second floor at the southern end, as does some of the original wallpaper in a room off the ground floor. The heating vents were fed by hot water pipes connected to a boiler in the basement. Chairs and metal furniture/structures bear the original SAI (South Australian Institute) logo and are small by today's standards. The Mortlock Wing is regularly included on lists of the world's most beautiful libraries, and on travel blogs, and is a significant tourist attraction in South Australia. After the opening of the new Public Library building in 1884, the Board of Governors was so pleased with the grand chamber they decided it needed a clock. Board member Charles Todd offered to buy one when he went overseas in 1885. It cost £50 which was a fortune in those days, equivalent to $3,000 today, because it was a very accurate timepiece from Dent and Sons in the Strand in London. It was installed in 1887. One of its features is a mechanism for having the hands set hourly by a signal from the Observatory, where Todd was the Postmaster-General, Superintendent of Telegraphs, Government Astronomer and Meteorologist. He is best known as the engineer responsible for constructing the Overland Telegraph Line from Adelaide to Darwin, and the name of his wife Alice lives on in the name Alice Springs. Sir Charles Todd is also the longest serving member of the Board at 44 years from 1866 to 1910. Today a staff member winds the clock each week and it keeps excellent time. Todd had urged the introduction of electric light for the Library as early as 1884, which the government declined due to its cost. The Board's annual report for 1910-11 noted: 'The baneful effects of gas upon the leather bindings of books is a well-established fact, to say nothing of the vitiated atmosphere necessarily inhaled by students and others who visit the Public Library at night time. It is therefore hoped that an early installation of electric light in these buildings will be made'. Finally in 1914 electric light installed in the Public Library.